You can add or remove as many chairs as needed from tables to accommodate your guest list. Learn more here. We know that your seating needs may vary for your guest dining tables, so we've made it easy to add and remove seats by table. Here's everything you need to know about adding, removing and adjusting seats in your layouts. Your layout includes two to views - a LAYOUT view and a TABLE view. Any changes you make to one view will effectively update the other view, so please keep this in mind when making any edits within either view. The first time you visit the Layout & Seating tool within a project (even if you've previously created a seating plan using our former Seating tool), you'll be asked to select from three options (Start with a Blank Canvas, Start By Uploading a Floor plan or Start with Simple Seating.) Don't stress about making a decision, all three options eventually lead you to the same place, but may take slightly different paths to get there! Once you've added a table with chairs by dragging and dropping it from our object library onto your canvas, there are two ways to remove seats from a layout. You can click on any chair to select it (or select multiple chairs by holding down the shift key and then clicking each chair, one at a time), then delete by clicking on the delete button to the top left of your layout or by hitting the delete button on your keyboard. This is especially helpful if you'd like to remove chairs at each end of a banquet table. 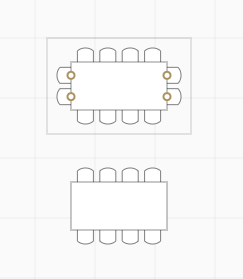 You can also adjust the chair or seat counts by clicking on the table, then using the shape menu to indicate how many seats you would like on each side of this table This is the best way to ensure that you have the exact count of chairs on each side of a table, especially if it's particularly long, like a head table. To add seats to a round table, click on the table in your layout and then use the Shape menu to adjust the number of seats at that table. Adjusting the seats using the shape menu (vs. clicking to delete extra chairs) will ensure that the seats appear evenly around the table. 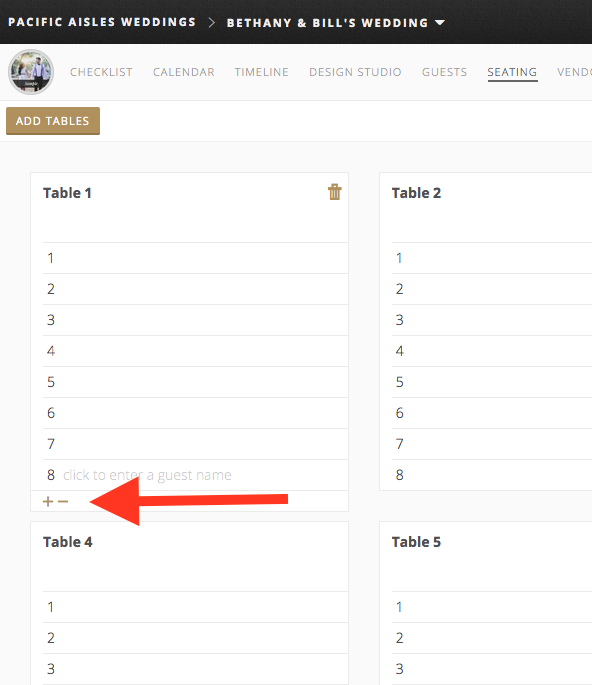 To add seats to a long table, click on the table in your layout and then use the Shape menu to adjust the number of seats on each side of that table. To remove additional seats such as middle seats, you can click on any chair to select it (or select multiple chairs by holding down the shift key and then clicking each chair, one at a time), then delete by clicking on the delete button to the top left of your layout or by hitting the delete button on your keyboard. If you're working the Table View within your Layout & Seating tool, to add a seat to a table, hover over the last seat and click the “+” sign at the bottom to add more seats to a table. 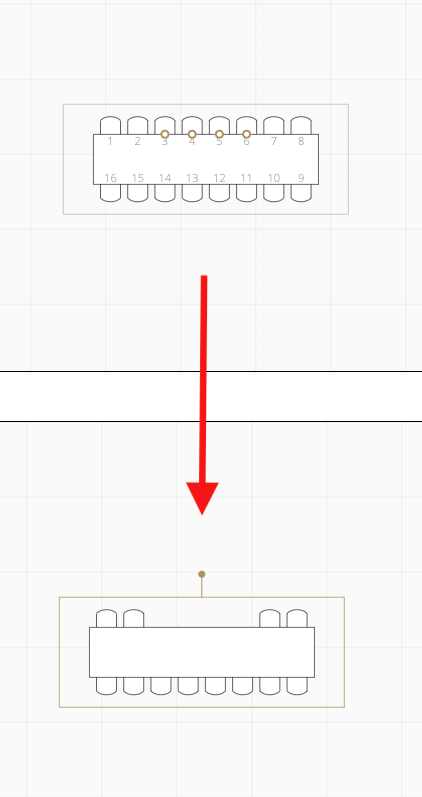 Click the “–” sign to remove seats from a table. Pro Tip: Any changes you make here in the table view will sync to the layout view, so please keep this in mind when making any edits in this view. If you have extra spaces left at a table once you've assigned seating, and you don’t wish to place extra chairs, we recommend that you remove any extra seats from that table, to give specific direction on chair counts on both layout and table lists.